CONVENTIONS are, of course, conventional. These elaborate quadrennial pageants are designed to bring the disparate and unruly emotions and needs stirred up in the primary campaigns into line with Party orthodoxy. Ideally, these underlying drives are focused and sharpened into coherent and compelling positions that can achieve enough broad popular support to prevail in a general election. The Democrats are currently behind in this process, and this is reflected in polls that show the Republican nominee up by 6 points. The first half of the first night of the Democratic Convention in Philadelphia was not dissimilar to what we saw in Cleveland, from the other side. Traditional Democratic topics were broached, sometimes articulately and sometimes clumsily, by the party faithful, in a desultory stream. Things began to come into focus when Senator Cory Booker took the stage. He began: “Two hundred forty years ago, our forefathers gathered in this city and declared before the world that we would be a free and independent nation. Today, we gather here again, in challenging times, in this City of Brotherly Love, to reaffirm our values, before our nation and the world.” In the end, Booker’s speech did not quite rise to the level of Barack Obama’s at this convention in 2004, but it did introduce a future national leader to a larger number of Americans. It also made some of us wince at the lost opportunity of Hillary’s choice of running mate. If she had taken a chance with Booker or Elizabeth Warren or even Bernie Sanders, this might already be a different kind of race. The big donkey in the room tonight, of course, was the reluctance, or possible inability, of Bernie Sanders’ 1824 pledged delegates, and many more supporters among the 20,000 or so gathered here, to switch their allegiance and get behind Hillary Clinton. Tonight, they booed, hollered, changed Hillary signs to read “Bernie Trumps Hate,” sat on their hands, and finally wept, as their champion tried to move them into the mainstream of the Party. The Wikileaks/Russian email dump (now we care about your damn emails!) proved what Sanders had claimed all along, that his campaign was discriminated against by the people who make the rules, and this stoked the feelings of betrayal among Sanders supporters to a white heat. This first night was designed to placate, assuage, and convince them. Sarah Silverman didn’t aid in this by saying their resistance was “ridiculous.” It is not ridiculous to believe that things can change and to fight for it. These Bernie supporters are the future of the Democratic Party, if they have one, and the leadership needs to recognize that, if they are to survive this election. Michelle Obama recognizes it, and she gave one of the best convention speeches of the modern era. “We cannot afford to be tired or discouraged or cynical,” she cautioned, because the stakes are too high. Her argument against Trump was based on a plea for the protection of children, and she made the strongest case I’ve yet heard for a Hillary Clinton presidency. She also lifted the entire proceedings into a higher realm when she said, “I wake up every morning in a house built by slaves.” If the Democrats don’t make and distribute a stark comparison between the speeches of Michelle and Milania, aside from the plagiarism, they should be prosecuted for malpractice. 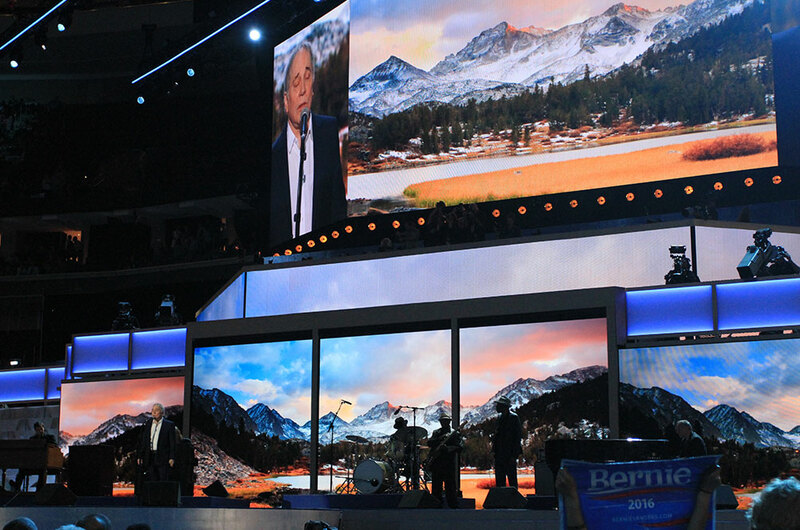 For me, on the floor tonight, the best moment happened when Paul Simon came out of retirement to sing “Bridge over Troubled Water” like it’s never been sung before, as blue light softened the faces of the delegates and obscured the messages of competing floor signs. He was singing, not just to aggrieved Bernie supporters, but to all Democrats, and even more to all eligible voters, in the hope that they will wake up and get serious about the real threat of the Trump candidacy, before it’s too late.